25 March 2015, at 12:00a.m. Egg consumption per person in the Americas continues to grow and to remain well ahead of the global average, observes industry analyst, Terry Evans. Although many factors – including the impact of rapidly escalating costs on profitability and disease outbreaks – have applied a brake to the expansion in egg production in many countries, the supplies available for consumption on a per-person basis have shown a positive trend in all regions of the world (Table 1 and Figure 1). Thus, despite periodic set-backs between 2000 and 2011, the world average uptake increased from 8.1kg to 8.9kg per person, while currently, it will be around 9.6kg. For the Americas, the figure rose from 10.5kg to 11.8kg per person in 2011. 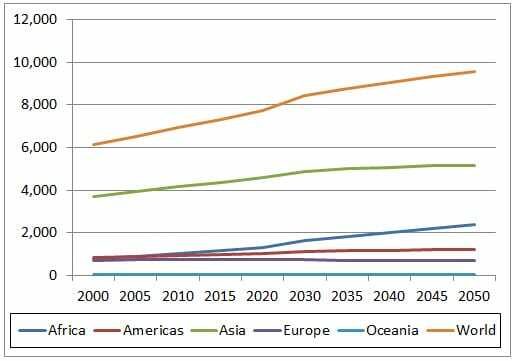 Based on Professor Windhorst’s production estimates, global consumption will be around 10.3kg per person by 2030. Measurement of actual egg consumption takes place in only a few countries, the figures presented by the FAO being estimates of the available supplies divided by estimates of the human population. There is considerable scope for error in the calculations around the estimates of layer numbers (especially where village or backyard flocks make a significant contribution to production), average yields, the average weight of an egg (where consumption is expressed in kilogrammes per person), and also in the estimates of human populations. Indeed, the variation between the theoretical and actual quantities of eggs available for consumption could range from between five and 20 per cent, depending on the reliability of the data used in the calculations. With such considerable scope for error, the data for individual countries are best used as a guide to the trend and too much attention should not be paid to the actual figures and particularly to small differences from year to year. Also, care needs to be taken when comparing the data between countries. The Americas currently account for around 13.5 per cent of the world population although by 2030, this share will have slipped a little to 13.3 per cent and 12.9 per cent by 2050 (Table 2 and Figure 1. While the picture of the supplies of eggs per person for the individual countries (Table 3) is most heartening, there are a few countries where the 2011 figures are below those calculated for 2000. Occasionally, the figures are questionable, such as the uptake estimates for Guyana in the years 2007 and 2009 but for most, even though some absolute levels may be open to query, the figures give a realistic guide as to the trend within a country. The wide range from 0.5kg to 19kg per person around the regional average of 11.8kg, gives hope that considerable further increases can be made in the future. This is likely to be mainly dependent upon improvement in consumer incomes as few egg industries in the world, let alone the Americas, spend significant sums on promoting eggs. No country spends more on egg promotion than the United States. From a levy of 10 US cents per 30 dozen eggs, the American Egg Board (AEB) raises an annual promotional budget of some $23 million. However, this represents only a tiny percentage of the value of the US egg industry and is much less than the promotional expenditure of competitive food products, such as the breakfast cereals market, which is in decline despite a total advertising spend of more than $600 million a year. The USDA has adjusted its consumption estimates to reflect 2000 census data. As a result, the estimates of uptake have risen from 251.7 eggs per person in 2000 to 255.2 eggs in 2013. The 2013 rise over the previous year was most remarkable as increased retail sales were achieved despite higher egg prices – a good indicator that the AEB’s promotional efforts not only boosted sales but also lifted the demand for eggs. For 2014, the latest estimates show a further significant increase to 260.7 eggs per person, while the forecast for 2015 shows another large rise to 265.2 per person. According to UNA, the poultry producers' association in Mexico, egg consumption in 2015 is expected to reach the 2011 level of 22.4kg per person, as domestic production appears to have recovered from the effect of the avian influenza outbreaks. Since 2011 uptake has risen to 20.8kg in 2012, 21.7kg in 2013 and 21.9kg in 2014. Brown eggs are perceived to be of better quality and higher protein content than white. Lack of knowledge about eggs and myths discourage egg consumption in Brazil. Uptake is low at just 170 eggs per person compared with around 350 in Mexico. The country's Egg Institute, in conjunction with the Brazilian animal protein association (ABPA) with the support of other interested parties, have set a consumption target of 208 eggs per person by 2016. Although egg consumption in Argentina has escalated from 135 to 244 eggs per person over the past decade, surveys have revealed that consumers still do not use eggs in either lunch or dinner menus. Due to changing dietary habits, egg consumption in Canada dropped from just under 22 dozen in 1980 to a little over 17 dozen in 1995. Since then, it has trended upwards to almost 21.4 dozen in 2013, according to Statistics Canada. Egg consumption in Peru has climbed from 154 per person in 2010 to 168 in 2013. In quite a few countries around the world an increasing proportion of eggs are broken out for eating in product forms. For both the US and Canada, roughly 30 per cent or so is handled in this way, representing average consumption figures per person of 77 (shell egg equivalent), up from 74 in 2009 for the USA and 70 (up from 45 in 2009) for Canada, according to these countries representatives’ reports for the International Egg Commission. In Brazil, the uptake of products is small at around 10 eggs per person although this is a healthy improvement on the 2009 figure of just seven eggs. More eggs are also being consumed as products in Argentina, the number as a shell egg equivalent rising from 13 in 2009 to an estimated 23 in 2013. In Peru, the number of eggs eaten in this way has increased from around five to nearly seven over the same period of time. Go to our previous article in this series by clicking here. With no obvious cause, piling raises welfare concerns for poultry producers.